Huawei has only several more days before the grand unveiling of its new P30 series smartphones, but with so much information about the phone leaked online in the last month, it’s hard to get excited about it. To top it off, the latest tweet by serial leakster Evan Blass (@evleaks) actually lists down and confirms several more features of the P30 series. The link provided in Blass’ tweak is already dead, but thanks to another quick-witted Twitter user, he was able to recover the original copy via the Wayback Machine. The post contains six key points about the P30 and P30 Pro, plus an official launch date for the phones in Singapore. 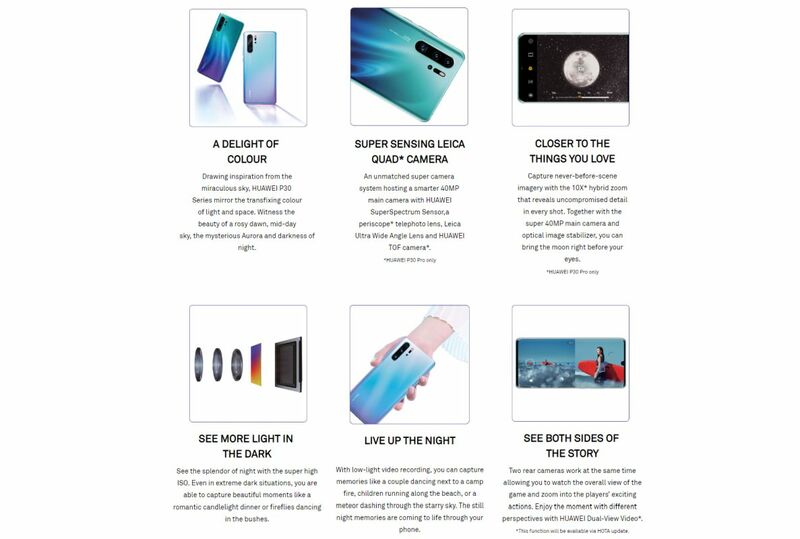 Thanks to the page, we now know that the phone will feature some pretty unconventional colours that “Draws inspiration from the miraculous sky”. Judging from the promotion image, it’s also likely that the brand’s iconic Twilight Purple colour will be making a comeback. More to the point, one of the key points listed on the page confirms the presence of a main quad-camera system on the P30 Pro. Echoing what Huawei’s CEO had initially confirmed himself a little more than a month ago. Other key points also lists down the phone’s ability to perform 10x hybrid zoom, and the ability to capture pictures and record videos clearly. In low-light environments. One feature to take notice of is Huawei’s Dual-View Video mode. According to the copy, the feature will use two rear cameras of the P30 and P30 Pro to watch the overall view of an area. At the same time, another half of the phone’s display will provide a zoomed in view of the same subject, thus giving users two different perspectives of the same scene. The only thing missing from all this is the official pricing of the phone. It’s clear that Huawei is holding back that last bit of information for the phones’ grand launch in Paris. After all, the company still needs something to announce at its event.